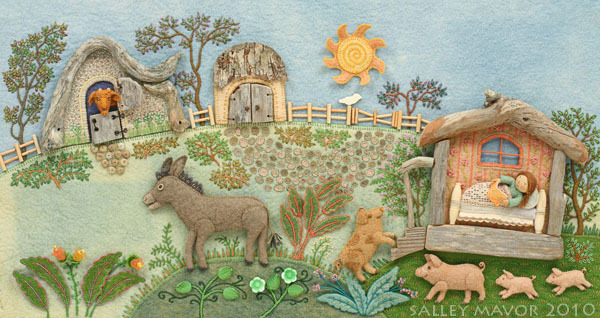 I’m pleased to let you know that an original fabric relief illustration from Pocketful of Posies will be part of a special exhibit at the Concord Museum in Concord, Massachusetts this fall and winter. My contribution is the double page spread of “Donkey, donkey old and gray” and “Elsie Marley, shes so fine, she won’t get up to feed the swine”. I thought this would be a good opportunity to revisit this piece and show some process photos about adding the border. 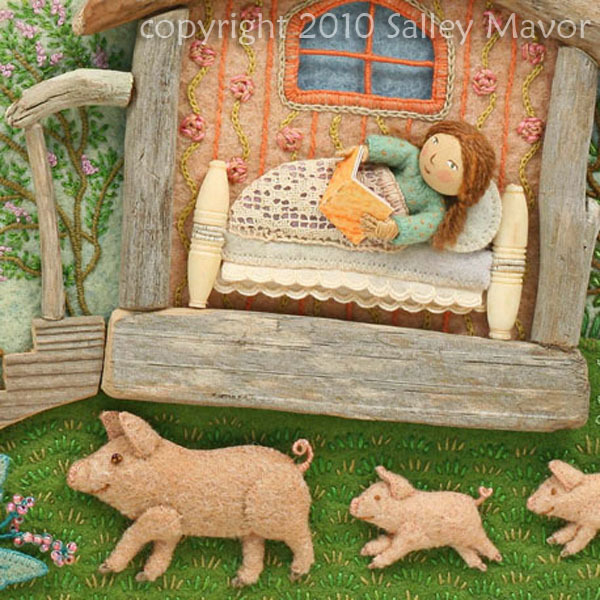 First, here are the particulars: Oct. 10 – May 3, 2015 ~ Good Night, Sleep Tight: Art from Children’s Literature will feature over twenty original illustrations from classic and contemporary children’s books woven around the themes of bedtime, dreams, and lullabies. My old friend and college mate Beth Krommes will also have an illustration from one of her wonderful books in the show. I will also be signing books at Author and Illustrator Day on Dec. 7th at the Concord Museum, Concord, MA. This event is held in conjunction with the annual exhibit, Family Trees: Celebration of Children’s Literature. After the illustrations were photographed for the book, I needed to make them presentable for their next life as framed works of art. 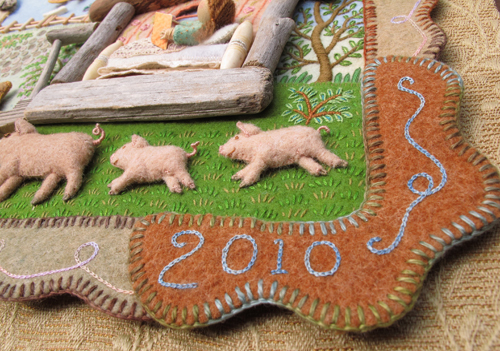 I cut out pieces of felt to make a border and embroidered them with my initials and the date. Although it took 3 years to make all 51 pieces, I treated the collection as one work and dated each piece 2010, the book’s publication date. 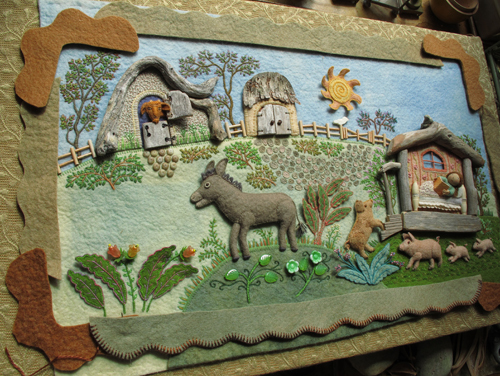 Then, I stitched the felt scene and border onto a stretched piece of upholstery fabric. And last, but not least, my husband Rob built wooden shadow box frames for all of them, which you can see here. See posts about making more of the borders here. 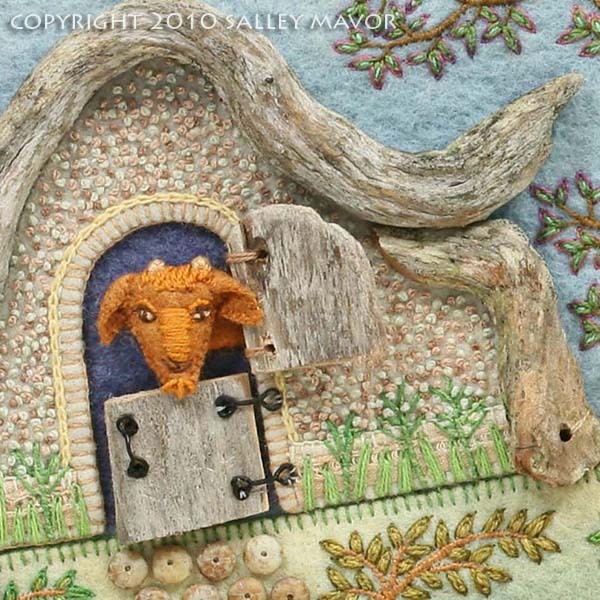 This entry was posted in Animals, Children's Books, Embroidery, Exhibits, Fabric Relief, illustration by Salley Mavor. Bookmark the permalink. The photographs taken obliquely really show more depth of the figures and viewers can appreciate them more in three dimensions. I’m so pleased you’ll be showing these up our way. 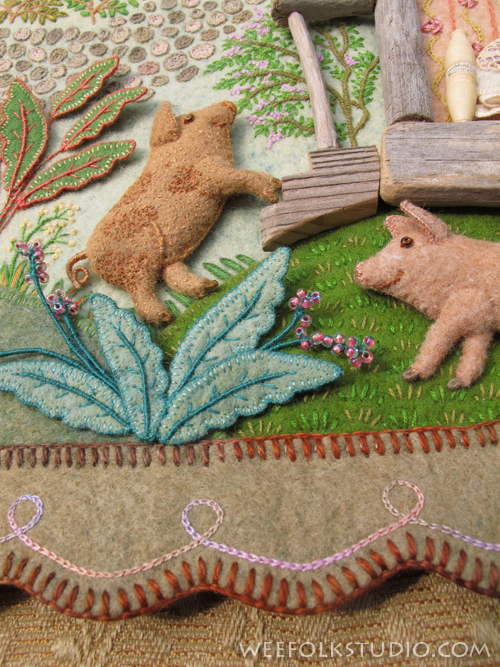 Hopefully, lots of handwork teachers —Waldorf and independent artists and sewing folks—will see your beautiful work. Salley, Rob takes the best close-ups.. I always blown away, even if it the subject is a piece I have seen many times before here or in books..It is like I am seeing it all over for the first time. So much details..it makes me gasp for air. Keep up the Great Work Rob.